Practical and sporty at the same time. 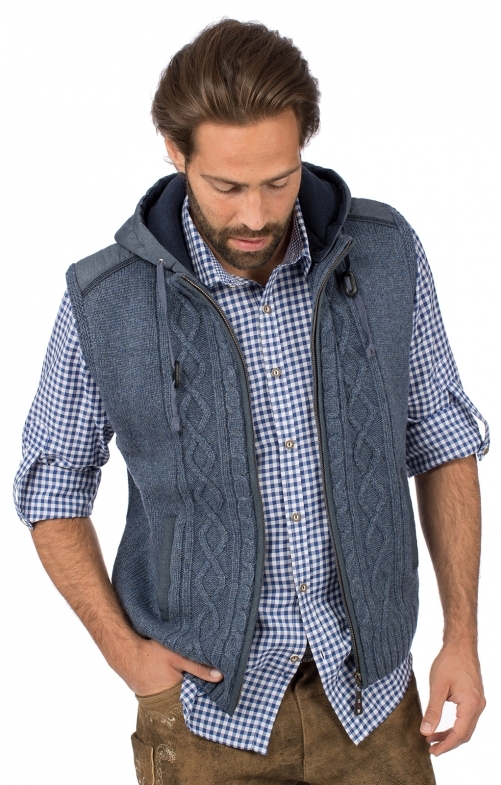 The hoodie knitted vest from the traditional fashion collection Spieth & Wensky. Heather colour denim blue. Braid and diamond pattern in front and in the back. This makes it very elastic and comfortable to wear. Zip with small leather tag. 2 side pockets with contrast fabric panel. With the drawstring, the hood width can be adjusted individually. The shoulders are also contrasted in the contrast of the type and colour and fit perfectly to this outdoor vest. The hood can be unbuttoned so that the knitted vest can be worn all year round.